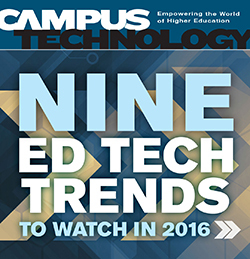 Four technology and innovation experts discuss the hottest trends in ed tech this year. The secret to improved IT services at Valdosta State University: students. As more classes go online, schools need a workable approach for giving students access to high-demand software. Instructors are experimenting with the Flipboard news reader to present learning content. NYU Tandon School of Engineering created an online pre-registration tutorial that uses gasification to motivate students to participate, keep them engaged and help them understand course requirements and curricula.